Here are some of the ways that working with living willow relates to the six key skills that are embedded in the National Curriculum. I suggest parts of the process that the children could get involved in and some projects that could be undertaken before, during and after the actual build. We are happy to work with the children at any of these stages. At the very least, I can give a talk to the children about the amazing versatility of willow and a slideshow of examples of our and other’s work. 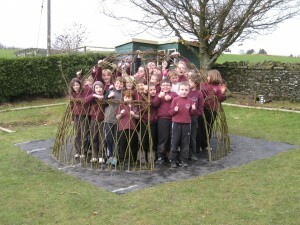 Researching and designing a living willow creation, working with Living Willow Wales, the other children, the teachers, people outside of school to explore the possibilities of willow, its limitations, its applications, etc. Exploring the different tasks and how these might be delegated: within the group, to people outside the school, who enjoys doing what. Creating diagrams and text describing the creation and the way that the creation would be expanded, modified, created differently for different environments and with different materials. Planning the build and gathering together the materials and tools needed; presenting the design. Calculating the materials needed for the build: numbers of willow rods, amount of string, and number of tools. Laying out the design on the ground using simple geometry. Thinking about the effect of the time of year on the growth of the willow, the time windows available and the time the build will take to design and build. Calculating the effect of shade and its length at different times of the year, and how this could impact on the willow and its need for plenty of sunlight. The amount of wind and general exposure could be studied: different kinds of willow can tolerate different amounts of exposure and wind. Calculating the length of the willow rods to achieve the required design: how long do the rods have to be to provide a 1.5m high tunnel. Use of mathematical and diagrammed solutions. Creating a scale model of the build. Exploring the amount of precipitation and exploring the drainage of the proposed site: willow needs lots of water so a south facing, rocky site could have test pits dug and the time it takes for water to drain away could be compared with a site with more clay soil. Exploring the effect of mulching the willow: grass will compete with the willow for moisture especially during dry periods. Different areas of the build could have different amounts of mulch and watering and their relative growth could be studied. The relative growth of different kinds of willow and different length rods could be studied: shorter cuttings generally grow more on the first year. Researching the willow, its design, location and other issues covered above. Preparing documentation and diagrams of the build. The relative merits of research and preparation using ICT rather than books and paper – I must admit I do enjoy being able to use a pen and paper to create the designs, and getting away from the computer. Communicating as above – emails, websites. Publishing the build process maybe into a newsletter or website. Working with the images and text created. Small group design work and research as above. Working with others from outside of school: Living Willow Wales, parents, library staff. Doing a post mortem of the design and build process and evaluating how things could have been improved, what really worked or areas that could be explored further. Which areas of the process were really enjoyed, which ones not so much and could possible be delegated. Foreseeing possible problems and how these might be worked around. Exploring what skills that could be transferred to other projects and real-life. 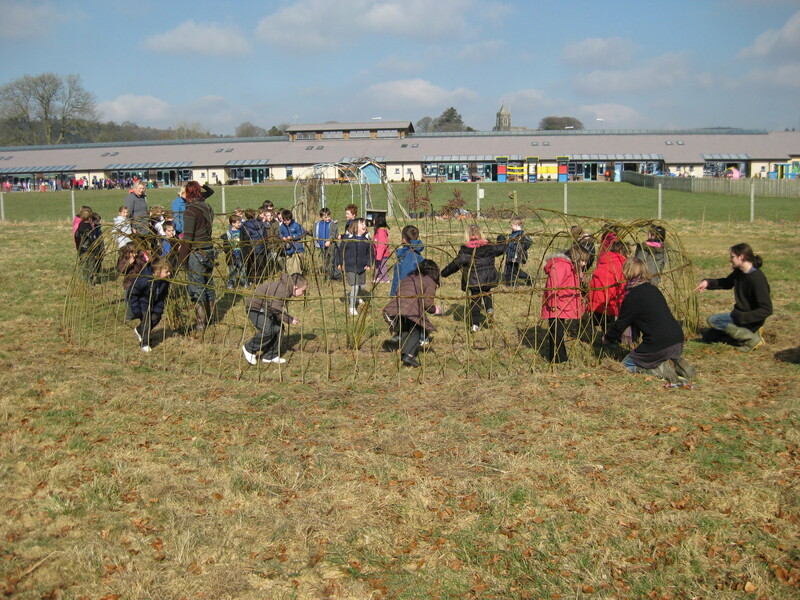 Looking at problems that were met and how they were dealt with – a common problem I’ve had in the last couple of years has been working around the bad weather: resourcing the willow, waiting for suitable planting weather, being able to get to the schools!